All about the empty spectacle, sound and fury building to multiple climaxes (without the pleasure). 115 min. Walt Disney Studios Distribution. Director: Mike Newell. Cast: Jake Gyllenhaal, Gemma Arterton, Ben Kingsley, Alfred Molina, Steve Toussaint. 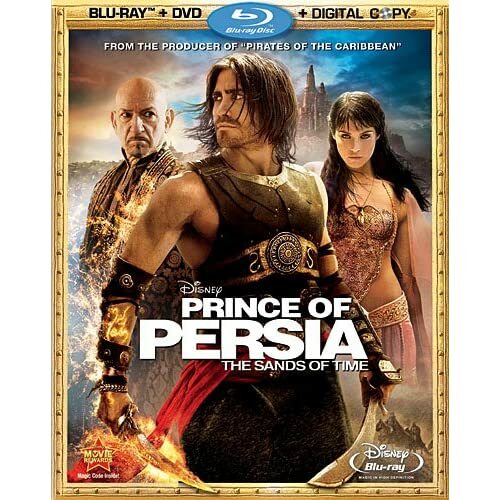 Aside from Jake Gyllenhaal's shocking new brawn, Prince of Persia: The Sands of Time holds no surprises. Derived from the video game series created by Jordan Mechner (who gets "screen story" credit), this Jerry Bruckheimer-produced Disney adventure is exactly what you'd expect of a Jerry Bruckheimer-produced video-game movie released by Disney. It's ultra-slick, noisy, and dumb in the modern Hollywood style, with a pounding score telling us when we're supposed to be excited or swept away with the epic romance of exotic adventure. Director Mike Newell (Donnie Brasco, Harry Potter and the Goblet of Fire) oversees operation of the machine, unable to do more than middle-manage us from set piece to set piece. Gyllenhaal plays Dastan, first seen as a plucky orphan child (William Foster) who so impresses the king (Ronald Pickup) that the boy winds up appointed a prince in the royal city of Nasaf. The Persian Empire's attack on the Holy City of Alamut changes everything, when Dastan lays his hands on the mystical Dagger of Time and suddenly finds himself public enemy number one, framed for the murder of the king. Dastan goes on the lam, forging an unlikely alliance with Alamut's Princess Tamina (Gemma Arterton of Clash of the Titans). The two strategize for short-term and long-term survival, which will entail protecting the dagger from a would-be throne-usurper who wishes to misuse it (could it beeeeee....Dastan's uncle Nizam, played by the conspicuously evil-eyed Ben Kingsley? ), as well as clearing Dastan's name and making peace with Alamut. Along the way, tax-dodging ostrich racing impresario Sheik Amar (Alfred Molina)—"a slightly dishonorable entrepeneur"—becomes entangled in Dastan's quest to restore order to the land. The action is a cross between Old Hollywood swashbuckling and "ancient" parkour (overseen by David Belle himself), with intelligence-insulting dialogue and expository voice overs spackling the gaps between the "magical mystery" special effects and the quick-cut action (albeit with unrestrained application of slo-mo).The ludicrous plot is only worsened by conventions like Dastan's exceptional luck in dodging speeding projectiles and the highly unlikely reunions of characters separated by time and space. In an odd reach for contemporary relevance, the conquering empire shows a lack of cultural respect and understanding while conducting an ill-advised search for weapons of destruction. 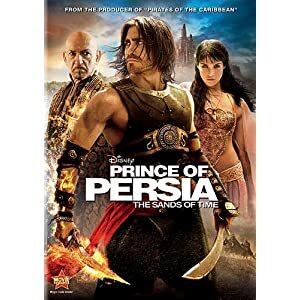 The plea for cultural sensitivity is conspicuously hypocritical, given that Disney hasn't won any friends by casting this twenty-first century movie like an old Biblical epic, with white actors playing Persians. The script by Boaz Yakin and Doug Mmiro & Carlo Bernard pays lip service to themes of honor, destiny, listening to one's heart, blah, blah, blah, but it's really all about the empty spectacle, sound and fury building to multiple climaxes (without the pleasure). The mysticism and "cheer the hero, hiss the villain" stuff is meant to play in the sandy Raiders of the Lost Ark mode, but Gyllenhaal doesn't have the ease and particular charisma needed to prop up a movie with so little dramatic meat on its bones. Molina livens up the proceedings a bit, but the all-too-generic Prince of Persia: The Sands of Time turns out to be like just about every video-game movie before it: as dramatically involving and dubiously thrilling as, well, watching someone play a video game. Disney delivers Prince of Persia: The Sands of Time in a deluxe Blu-ray + DVD + Digital Copy combo pack with a glorious hi-def transfer as the glittering jewel in the crown. The fully dimensional image retains its film-like quality with light grain, well-calibrated contrast and inky black level; colors are bold and skin tones are spot-on, with sharp detail and generous life-like textures. The winning streak continues with a DTS-HD Master Audio 5.1 surround mix that clangs and roars and rattles with awesome power and carefully positioned directionality for a potent, immersive aural experience. The primary bonus feature is The Sands Of Time (HD), a CineExplore track that can be enabled during playback to branch out to over forty featurettes. Disney also wisely includes a menu option for easy access to the featurettes outside of feature playback. The segments include extensive behind-the-scenes footage and cast and crew interviews with scores of cast and crew members, including director Mike Newell, producer Jerry Bruckheimer, stars Jake Gyllenhaal and Gemma Arterton, and key support staffers like Parkour trainer David Belle and stunt coordinator George Aguilar. The segments are "Rewind 1: Jerry Bruckheimer Introduction" (:51, HD), "Filming In Morocco" (2:16, HD), "Moroccan Marchers" (1:40, HD), "Rewind 2: The Next Action Hero" (2:12, HD), "Functional Fitness" (1:54, HD), "Walking Up Walls" (1:52, HD), "Rewind 3: Designing Persia" (2:49, HD), "Epic Dive Breakdown" (1:16, HD), "Rewind 4: Gemma Arterton: A New Kind Of Princess" (2:06, HD), "Making A Princess" (1:33, HD), "Rewind 5: Alamut From The Ground Up" (2:19, HD), "Layers Of An Ancient City" (1:00, HD), "Rewind 6: Parkour: Defying Gravity" (1:48, HD), "Parkour Legend David Belle" (2:00, HD), "Rewind 7: The Look Of Rewinding Time" (3:00, HD), "Rewind 8: From Gate To Film" (2:26, HD), "The Dagger Of Time" (1:59, HD), "Moroccan Artisans" (1:54, HD), "Rewind 9: Behold The Mighty Ostrich!" (2:51, HD), "Ostrich Jockey Tryouts" (1:41, HD), "Moe The Ostrich" (1:22, HD), "Rewind 10: Penny Rose: Master Costumer" (2:14, HD), "Snake Dude" (1:27, HD), "Rewind 11: Avrat Bazaar Fight" (1:26, HD), "Rock The Cashah" (1:05, HD), "How To Collapse A Tent" (2:34, HD), "Rewind 12: The Hassansins" (2:21, HD), "The Deadly Arts" (3:17, HD), "The Animal Lair" (1:23, HD), "Rewind 13: It Was Hot Hot Hot!" (2:37, HD), "Ostrich Love" (1:31, HD), "Rewind 14: Filming In The Atlas Mountains" (2:02, HD), "Rewind 15: The Making Of An Epic Battle" (3:09, HD), "The Whip Fight" (1:38, HD), "Rewind 16: A Knife Thrower's Shoot-Out" (1:38, HD), "Too Close For Comfort" (1:13, HD), "Rewind 17: Filming At Pinewood Studio" (2:24, HD), "Time-Lapse Of The Pinewood Sets" (1:03, HD), "Rewind 18: Making Sand From Scratch" (1:25, HD), "Rewind 19: The Sands Of Time" (1:08, HD), "Memories Of Time" (1:05, HD), and "Rewind 20: Jerry Bruckheimer's Photo Montage" (1:14, HD). Also included is the brief "Deleted Scene - The Banquet: Garsiv Presents Heads" (1:26, HD). Impeccable tech specs, an impressive behind-the-scenes look, and the combo pack triple play spell plenty of value for fans of the film. All site content © 2000-2019 Peter Canavese. Page generated at 04/17/2019 04:39:35PM.